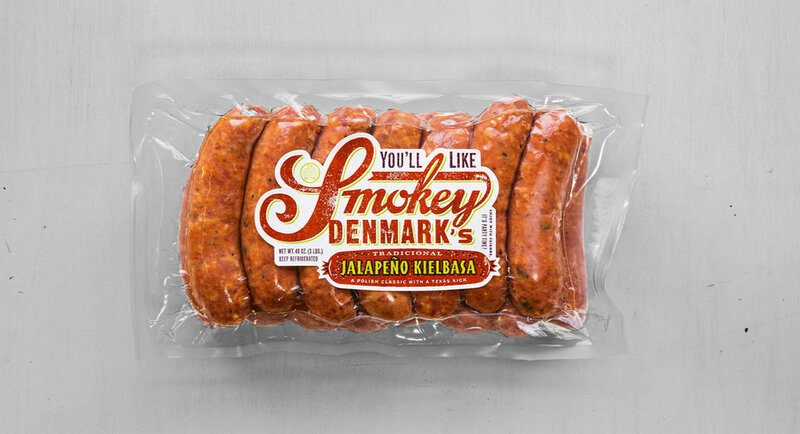 Sausage — Smokey Demark's Smoked Meats Co.
No spray-on smoke. No collagen casings. No bologna. Not now. Not ever. It's the tasty foundation to our sausage empire. This coarse-ground Cajun wonder is straight Louisiana sunshine. They ain't no joke. A spicy firecracker of flavor. Nicknamed "Smokey D's." Three pounder! All of this and more is available at our Meat Market Monday through Friday from 7:30 AM to 3:30 PM. Give us a shout if you have any questions. Made with bread like the folks across the pond do it. A Polish classic with a Texas kick. The best thing you'll eat all week. It's the Polish word for "sausage," and we consider ours the real deal. Serve 'em with pretzels and beer! This classic German fare redone with Live Oak Big Bark beer. You'll holler! A German classic with a cracked peppery flavor. Mild with a fine grind. Slice it up and eat it with cheese and crackers. Just like the Jalepeño Kielbasa, then add cheese to the party.